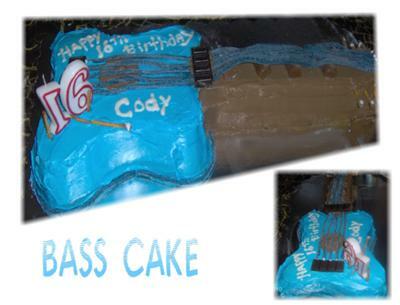 This bass guitar cake was made for a sixteenth birthday. I made four square cakes, cut them to look like a bass. The cake was caramel, with vanilla buttercream icing. I made the pickups out of Hershey chocolate and Tootsie Rolls, and strings out of Twizlers went around the base of the cake with Twizlers as well. I used some small pretzels for the wammy bar and string gears.